I always assumed that the hill is called ‘Bukit Nanas’ because there used to be pineapples planted on the slopes (nanas = pineapple). That’s what KL Forest Eco Park was known as, you know, until recently. Bukit Nanas Forest Reserve. The tiniest forest reserve in Malaysia. And yes, it is actually real rainforest – a remnant of the original lowland dipterocarp forest that once covered this part of the Klang Valley. But, at the top of the hill, where KL Tower looms, I overheard a tour guide with his group. And while indeed there were pineapples all over the slopes, they were not planted for being canned and sold. Not quite like the famous pineapple plantations of Johor. They were planted as a defense barrier to deter attackers of the stockade that was once at the top of the hill. That was a surprisingly interesting snippet! 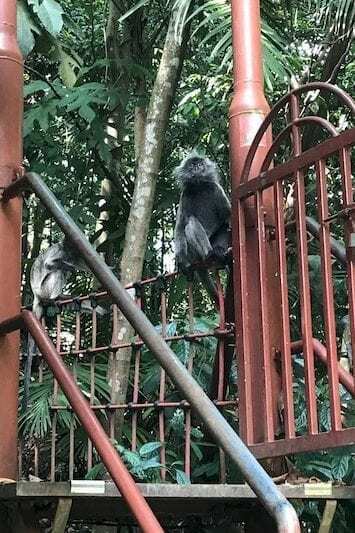 In the KLCC area, the two closest and most accessible points of green space are KLCC Park, and Bukit Nanas forest reserve. One belongs to Petronas, Malaysia’s national oil company. It is located in the shadow of the iconic Petronas Twin Towers, and is a flat landscaped park with fountain shows near the Suria KLCC mall. Fireworks are shot up from here at festive occasions. 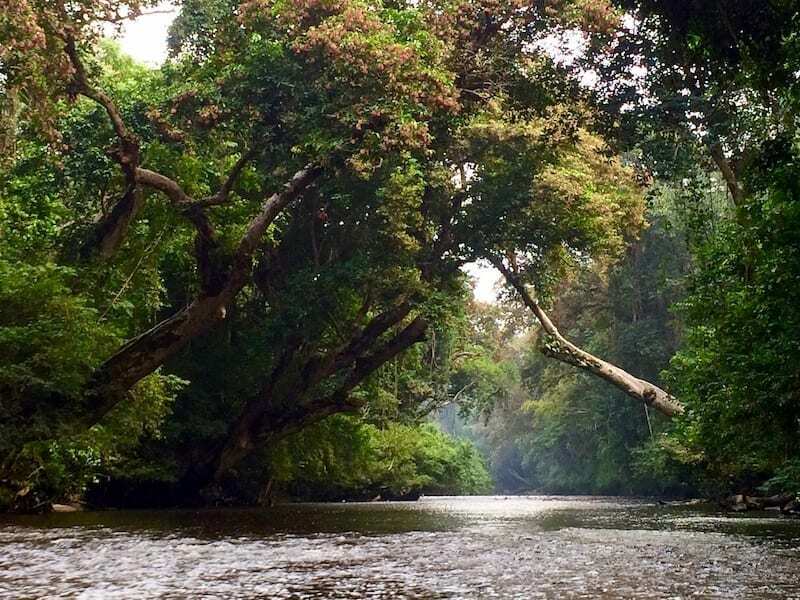 The other is a permanent forest reserve in Bukit Nanas. It is the only one in the city centre, and one of the oldest in Malaysia. It is undulating, and spreads down the hill where the almost equally iconic KL Tower stands. 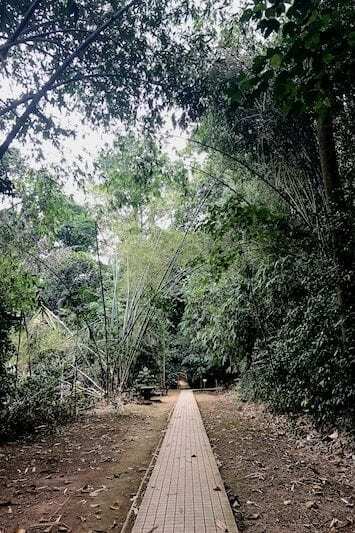 Perhaps the most accessible forest hiking spot in Malaysia, you can reach KL Forest Eco Park in multiple ways. 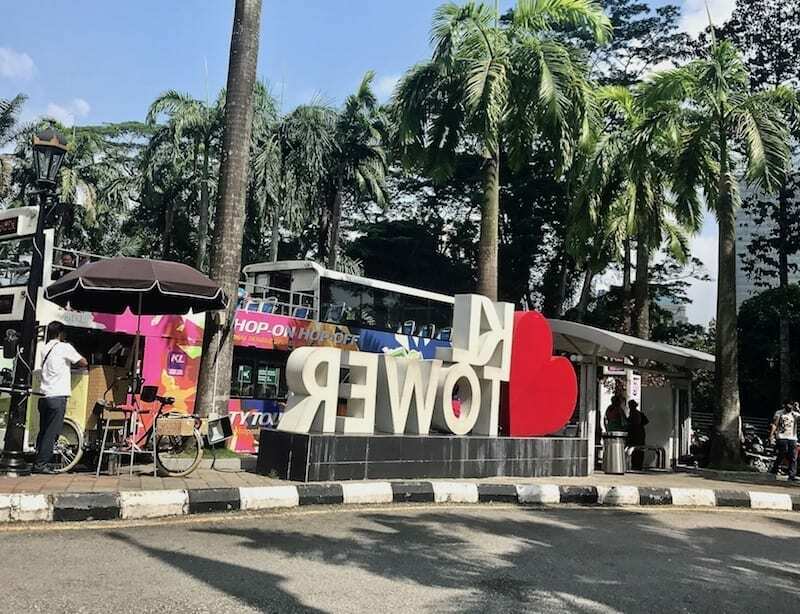 For visitors of KL, the Hop On Hop Off bus actually stops at the top of the hill, because it is the KL Tower stop (Stop 10 on the City Route). You can enter the forest from there. This is the point where I usually enter from, because I would come by car, and park at the top. This option is convenient especially for those also who want to pick up other KL attractions, and have already gotten the 48 hour ticket. You can also get there by the free GoKL City Bus. KL Tower is on the purple GO Sightsee line. Like Option 1, this means you begin hiking from the top of the hill. Or if you happen to be on the blue GO Work line for some reason, you can also get off at the Bukit Nanas stop, and begin hiking from the bottom. (But, you’ll have to walk around the base of the hill for a bit to get to the entrance of KL Forest Eco Park). You have two options for train travel. You can take the Kelana Jaya line on the LRT (Light Rail Transit). 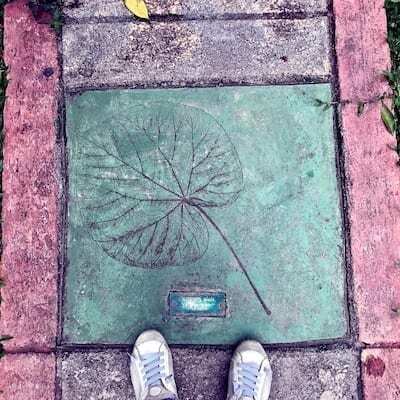 Get off at Masjid Jamek station and walk a bit to the entrance. The second option is by KL monorail. 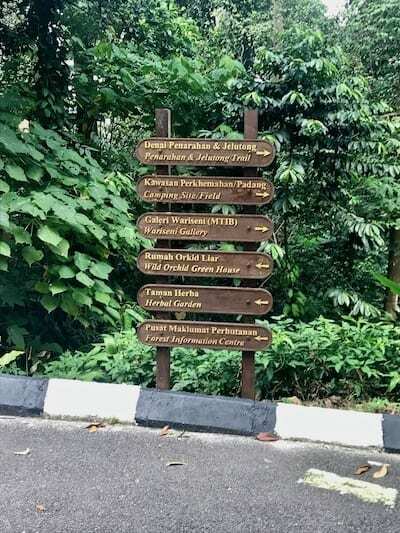 The Bukit Nanas and Raja Chulan stations on the KL Monorail take you the closest to the KL Forest Eco Park entrance at the base of Bukit Nanas. 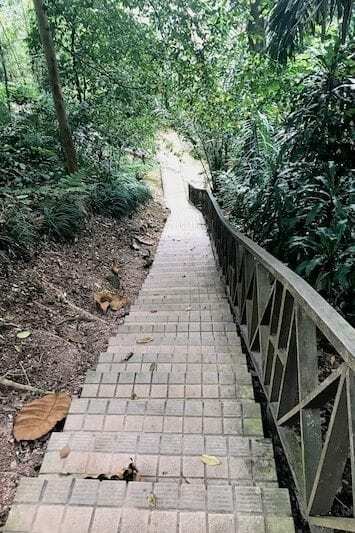 Bukit Nanas is among the easiest places to hike in Kuala Lumpur. Although a rainforest in actual fact, when you’re inside KL Forest Eco Park, it almost does not feel that way. They’ve constructed raised trails for much of it, so you don’t really get the ‘feel’ of jungle walking*. Nonetheless, this is probably a prudent and responsible upgrade. It is safer for the casual city visitor, for example. I’ve seen tourists arrive at FRIM for hiking with fashion sandals, where the man-made forest is mostly left natural. This wouldn’t be suitable footwear for FRIM, where you may have to cross streams, but you can get away with it at KL Forest Eco Park. For another thing, it’s less wear on the trails too, considering the expected number of visitors. 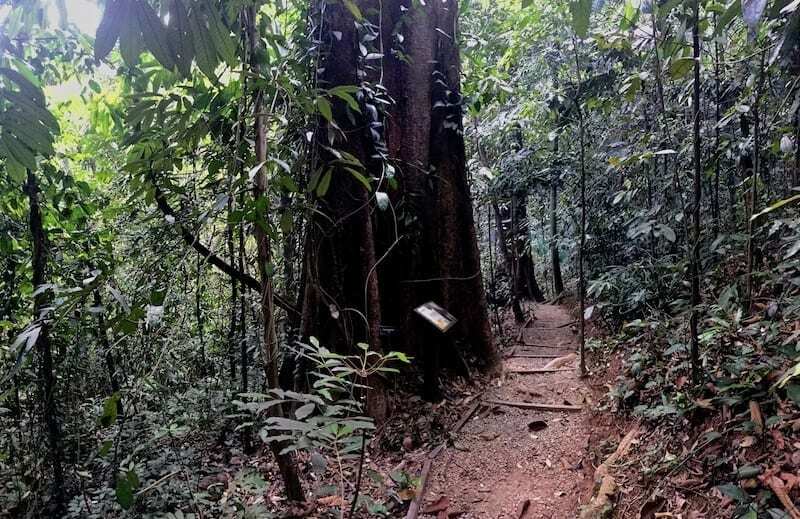 The most popular tour hikes in the real, real rainforest of Taman Negara also takes place on plank paths raised over the forest floor. Within, the paths are quite well-signed and there are trail maps at intersections. However, even if you were to just hike randomly, it is also quite safe. You won’t get lost, since it really is a very small forest. You either end up going down, or up to emerge at the KL Tower platform. I began my hike from the top. That morning, I decided to just wing it. Even so, I still managed to pick up all the trails easily. 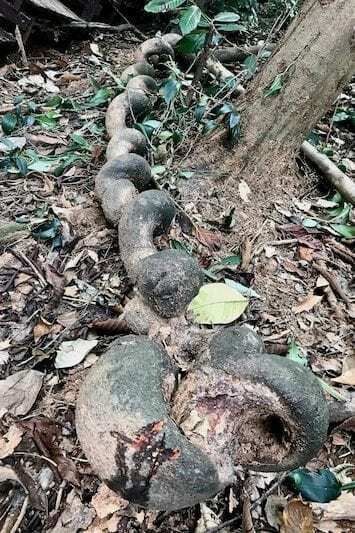 I went along the Penarahan trail first, where I found cool twisting lianas on the ground. They look like someone trained them to grow that way! 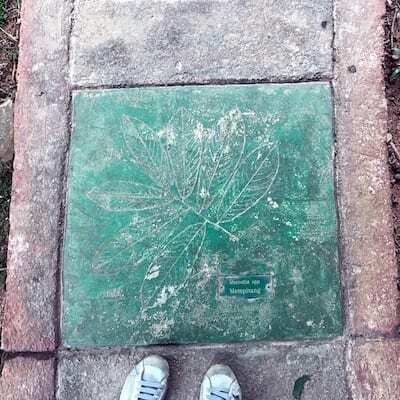 I saw this again in the Philippines, on a trail near Vigan. Looking up, at the right spot you can also see KL Tower through the gaps in the rainforest canopy. 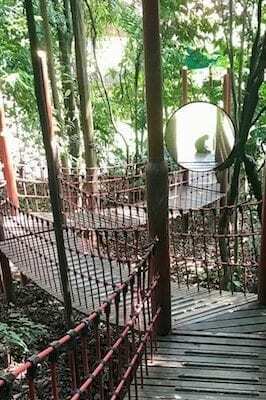 The Merawan trail goes down into what feels the most like real jungle within KL Forest Eco Park. The path slopes, but it’s stabilised by turning it into retained earth steps. So it is much easier than a raw jungle trail. 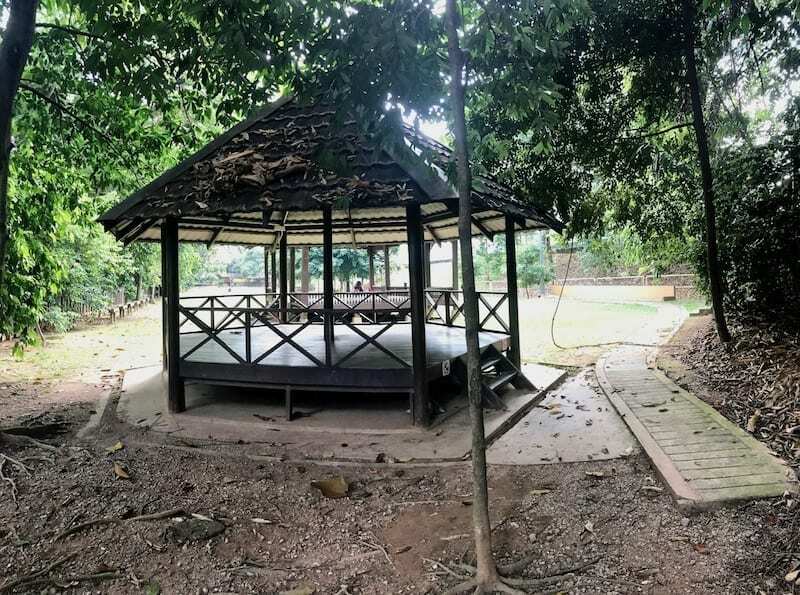 I’m still not entirely certain why there’s a lawn in the middle of Bukit Nanas forest reserve. Nonetheless, I sat under one of gazebos to rest, since the day was warming. There was an interesting hanging bridge before me, all done up in red. It seemed to rise into the woods. I wondered where it led to. I began having ambitions to hike up it to find out. With renewed motivation, I got up and approached the beginning of the bridge. And stopped. On the first span, I could see a monkey. It was a sort of black-grey, with a long tail, and was sat right in the middle. 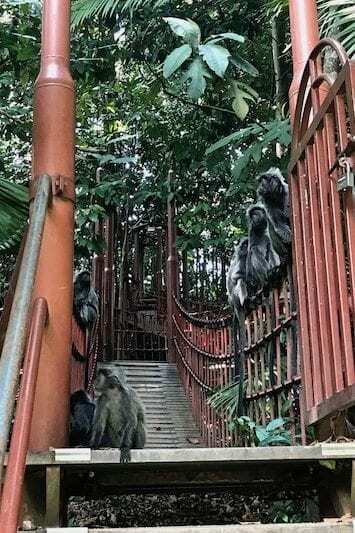 And then, I noticed the other monkeys – balanced on the cable ‘banister’ of the bridge. As I hesitated, some of the monkeys began to creep closer. Coming right to the very front, yet no more. Not leaving the bridge. Just staring at me. If I wanted to cross the bridge, it appears I needed to run the gauntlet of monkeys. Just as I was about to chicken out, a father and daughter tramped down the bridge. The monkeys shifted, and some scattered. The pair came out unscathed, the daughter loudly insisting that she wasn’t scared. It made me smile a bit. She reminded me of me – and where had my fire gone, after all these years? I saw my opening, and took it. I got onto the bridge and began to cross, wondering what was on the other side. The bridge did seem to connect to a set of stairs that continued upwards. Logically, it should lead eventually back to the KL Tower platform, or thereabouts. But there was a chain link gate, and it was locked. Well, this was an unexpected turn of events. I had not expected to have to risk the monkey gauntlet twice. I turned around, hoping that the way back would have stayed free of monkeys while I made my way up. So far so good. And then a little further. Still no monkeys on the span. I trudged down faster. But no. There, its silhouette clear against the midday sun, was a lone monkey, sitting on the path. Like a guardian. Oh good! The monkeys are gone. Eh, wait.... what is that? Oh well, there’s just one. I could probably breeze past just one, and run! To this day I have no recollection of what happened at the threshold – whether it ignored my passage, or went away at my approach. I only know that I passed without incident! 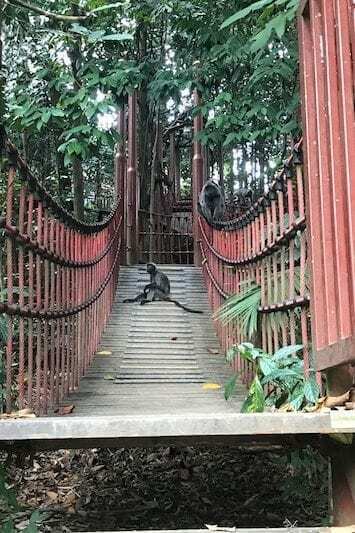 The reason that I never worry about monkeys when trekking in proper jungle, but I worry about them in an urban or suburban setting, is because of human trash. We throw away a lot of food in our trash, and the little buggers like our food. I’m not sure how much natural food there is in the forest reserve, but I’m pretty sure they’re supposed to go for that. But it’s obviously less tasty and less energy dense (no matter what the raw vegans insist), which is why we invented agriculture in the first place and reward culinary skill with celebrity chefdom. And being clever little buggers, it doesn’t really matter how you secure your trash, they will get to them. After all, they have opposable thumbs just like us. They just sort through the trash, open up the plastic bags, and then the food containers, just the same as we can. In fact, sitting back at the gazebo, I watched a monkey do just that. It took a plastic clamshell disposable food container which clearly still had food remnants in it, took it back to the bridge, and ate from it like a plate. At the other end of the lawn area, I was back onto constructed trail. At some point it led me to the Jelutong trail, but presumably the other end. Climbing back up, I eventually emerged to the bamboo stands, which was again neater than I expected. The sides of the path were cleared, and there were tables and places to sit. Nevertheless, the bamboo stands were impressive. They rose high, the tops leaning over the path and into each other. 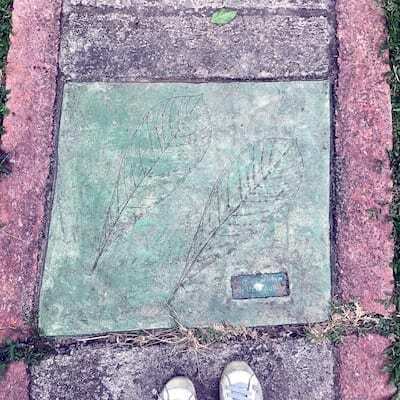 I made my way all the way back to my starting point at the KL Tower platform on top of the hill. 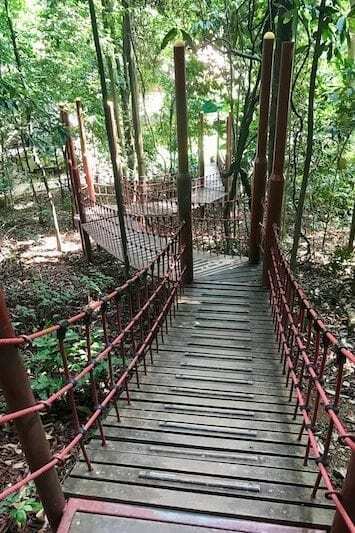 There is a fairly new forest canopy walkway at Bukit Nanas Forest Reserve. Unlike the one that used to be open to the public in FRIM, this one was constructed primarily for the visiting urban public. It is not supported by the trees themselves, but by constructed pylons among the trees. The spans and cables are metal. It feels sturdier, and sways less. There’s no romance to it whatsoever. But it is safe, aesthetically pleasing, and unless you’re acrophobic, it is not at all scary. Even the forestry educational information is delivered differently. 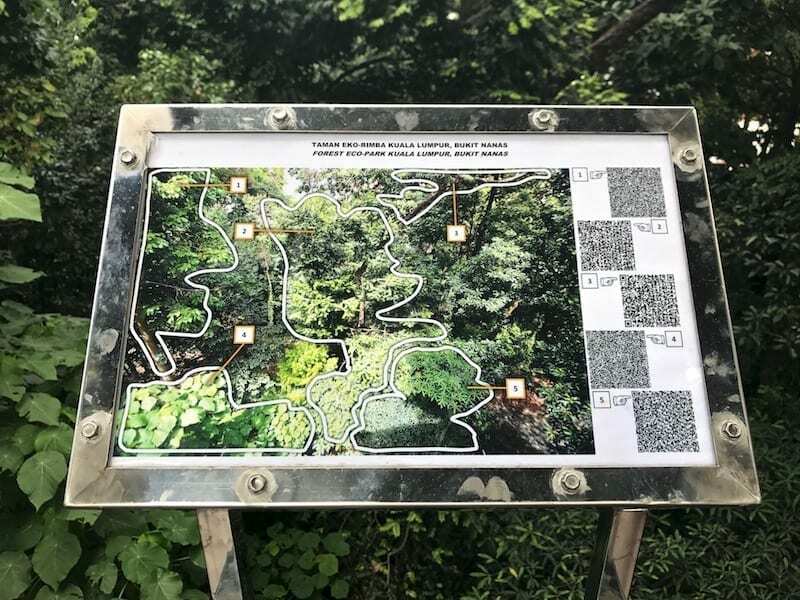 Info boards show a diagram of the canopy and understory you’re looking at, and point to QR codes that will display the information. So, it is perfectly designed for the target users. Except… the QR codes I tried directs you to information that was only delivered in Malay, which is not ideal for a site that also receives a decent flow of foreign tourists. Hopefully by now it has been made a bit more inclusive. On the walkway, you gradually descend the hill via winding staircases at the supporting pylons. At the end, the stairs go down to the ground, and I opted to hike back up the paved path, since I had parked my car at the top. (This is the downside of coming with your own car). Otherwise, it connects to the Eco Park entrance at the bottom of the hill. 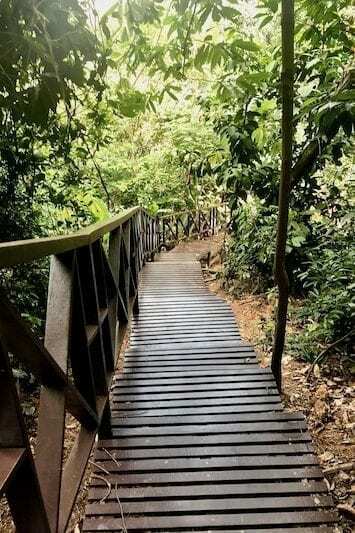 All in all, Bukit Nanas is a fairly easy half-day hike, at most. Very suitable for a quick break from a tour of the KL urban jungle. 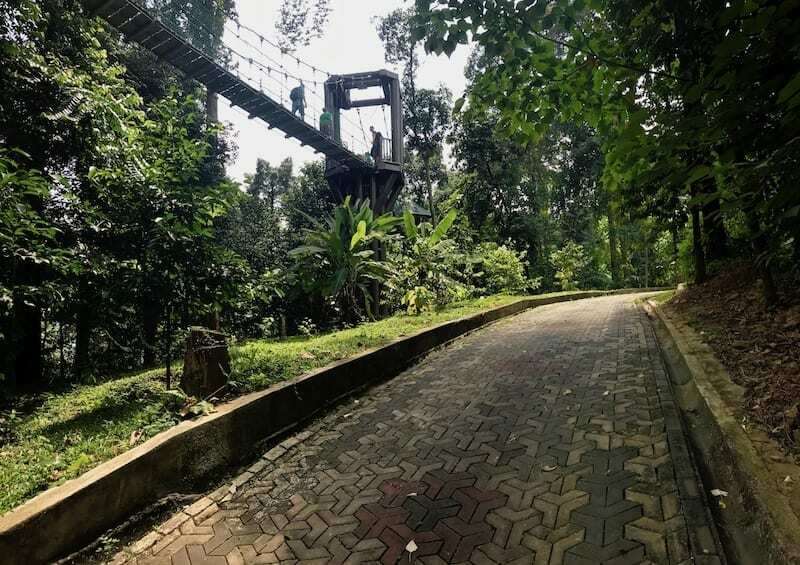 *For a nearby urban forest that has more of a jungle hike feel, check out Bukit Gasing in Petaling Jaya. I would have loved to do this in Kuala Lumpur but ran out of time on my last trip. Next time for sure. KL has so many things to do, for pretty much any sort of traveller! This is a great post, thank you. I will be in Malaysia next month and thought of skipping this. But your post convinced me otherwise. Would need to find time for this! Nice! I hope you have a good time in Malaysia! 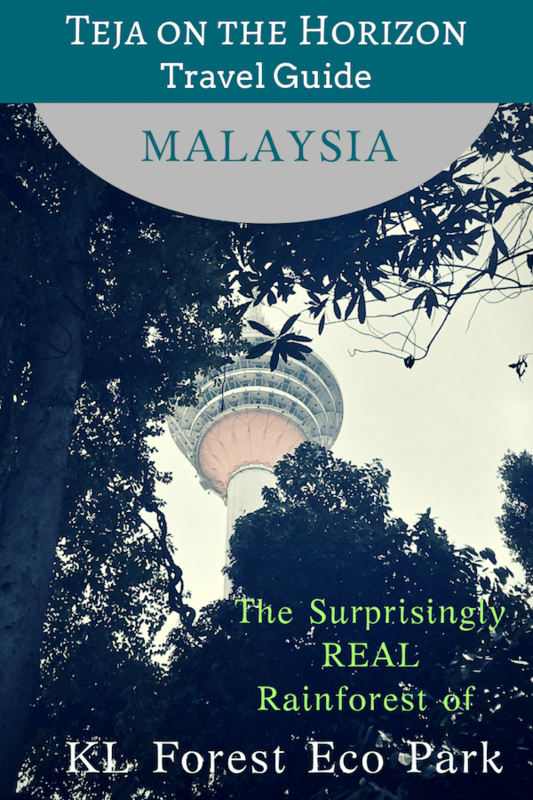 You’re welcome to check out my other Malaysia articles for inspiration! It’s a great country to explore! I absolutely love the Southeast Asian rainforest! Typically, I go to Borneo to stay in the rainforest, but it’s great to know that there is a good patch so close to KL. Love it that it is on the Hop on Hop off bus route! I would be a perfect change of pace amongst all the city sightseeing. Well of course… if you came specifically for the wilds, Borneo or a couple of the peninsula’s rainforest parks blows this little bitty thing out of the water! But if you’re in the city and desperate for greenery (= me when I travel to other people’s cities), then this is the perfect option. Good to know that the KL Hop on Hop Off stops nearby. Putting this on my list for when I get to KL next year. Oh it stops right at the top entrance arch, nearly! Glad you found the guide useful!